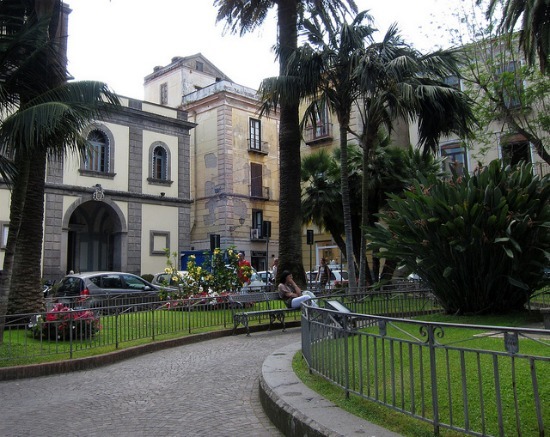 Enjoy the architectural charms of Sorrento’s historic center! Located just a short train or boat ride from Naples, the charming town of Sorrento is a lovely day trip or home base near the Amalfi Coast, Capri and other top travel destinations in southern Italy’s region of Campania. 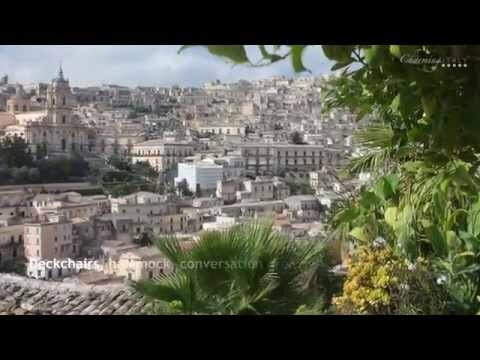 A visit to the town of Sorrento tops many tourist lists, and for very good reasons. This pretty seaside town boasts a charming and lively historic center, stunning views across the Bay of Naples and easy accessibility from nearby Naples, Capri and the Amalfi Coast. 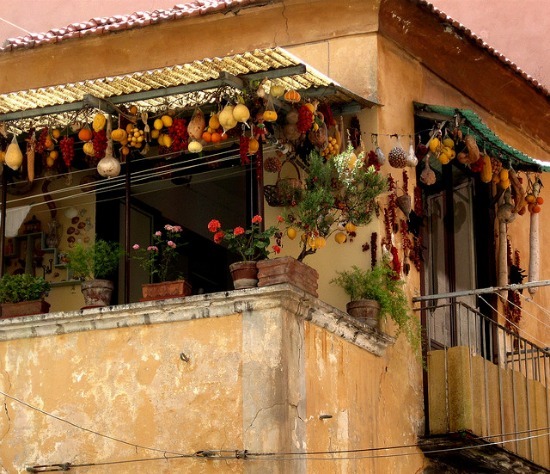 Here are the top 5 architectural highlights not to miss during your stroll through Sorrento’s historic district. Just steps down the Corso Italia from Sorrento’s central Piazza Tasso, the first thing you might spot marking the town’s largest church is the rich red, yellow and dark stone tiered bell tower with a colorful majolica clock. Step off the road into the tiny courtyard and you’ll find the entrance to the Cathedral of San Filippo and San Giacomo, commonly referred to as the Duomo. Don’t let the modern façade, which was rebuilt in the beginning of the 20th century, deter you from entering. 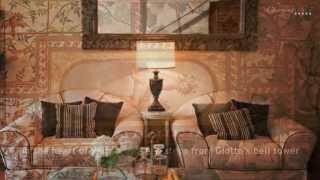 Inside you’ll discover a beautiful interior decorated with many fine examples of the intarsia, or inlaid woodwork, that has made Sorrento artisans famous for centuries. 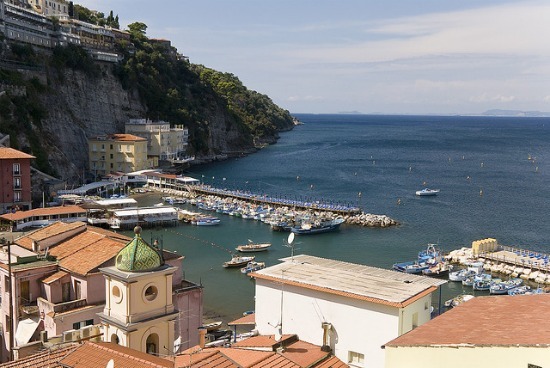 While exploring the historic streets of Sorrento, wind your way down toward the Villa Comunale park with scenic views across the bay toward Naples and Mt. Vesuvius. Nearby you’ll see the entrance to the Church of San Francesco, with a side entrance leading into a beautiful 14th-century cloister. 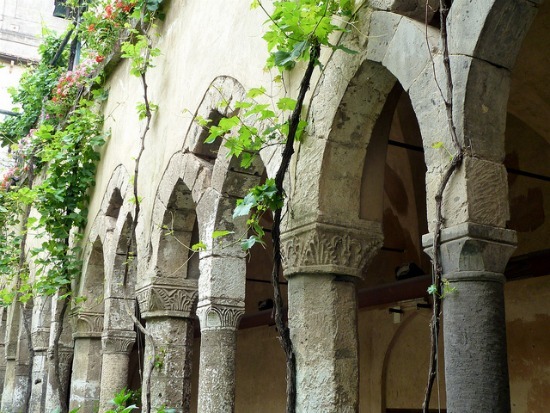 Once of Sorrento’s most peaceful spots, savor the architectural details of the columns surrounding the cloister as you stroll around. Notice the unusual mix of styles as the arches vary from rounded to interlacing pointed around the cloister. Follow the steep road and stairs that lead all the way down to one of Sorrento’s most picturesque spots, the small harbor of Marina Grande. Once separated from Sorrento above, don’t miss the ancient Greek gate that was once the entrance to town. Here you’ll find colorful buildings and brightly painted fishing boats in the peaceful harbor, which is a great choice for a relaxing lunch or dinner by the sea. Tucked away amid the historic streets of Sorrento, the Sedile Dominova is an unexpected find. 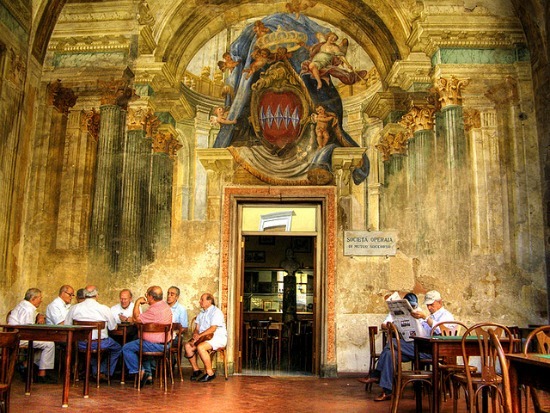 Located on the corner where two streets meet, stop and admire the loggia of this 15th-century building decorated with frescoes dating from the 18th century. You can still see coats of arms from the noble families of Sorrento that once used this building as an assembly hall. As you continue down the narrow streets, take a look back to see the intricate yellow and green majolica tiled dome of the Sedile Dominova. 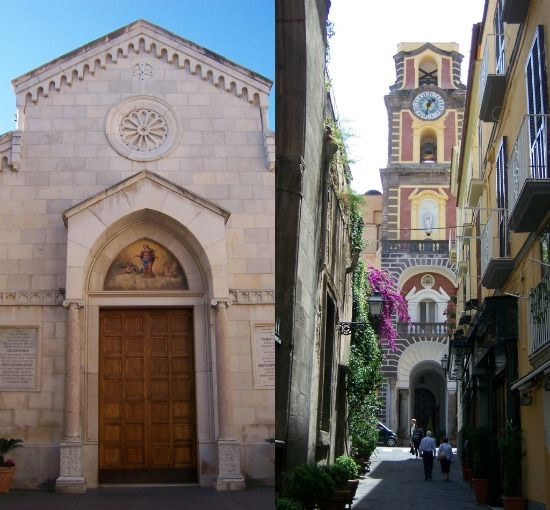 Located near a pretty piazza, Sorrento’s second most important church is dedicated to and houses the relics of Sant’ Antonino (St. Anthony Abbot), the town’s patron saint and protector. First constructed in the 11th century over an earlier church, the interior was later redecorated in the Baroque style during the 17th century. However, the elegant interior still includes some 15th-century details. Inside, don’t miss the elaborately decorated crypt dedicated to Sant’ Antonino, the ancient columns in the nave and the beautiful paintings and artwork.